As it was in 2016, the Hilton hotel brand has been determined to be the world’s most valuable hotel brand by leading valuation and strategy consultancy Brand Finance. According to a just-released report, the Hilton (NYSE:HLT) brand is worth US$8.37bn, up seven percent from its $7.82bn value in 2016. 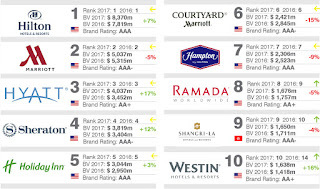 Marriott (NASDAQ:MAR), Hyatt (NYSE:H), Sheraton (NYSE:HOT), and Holiday Inn round out the top five, with values of $5.04bn, $4.04bn, $3.82bn, and $3.04bn, respectively. Holiday Inn is owned by InterContinental Hotels Group (NYSE: IGH). Different from brand value, Brand Finance also evaluates the power and strength of a brand based on factors such as marketing investment, familiarity, loyalty, staff satisfaction and corporate reputation. Brands are then given a corresponding letter grade up to AAA+. Brand strength is used to determine what proportion of a business’s revenue is contributed by the brand, which is projected into perpetuity to determine the brand’s value. 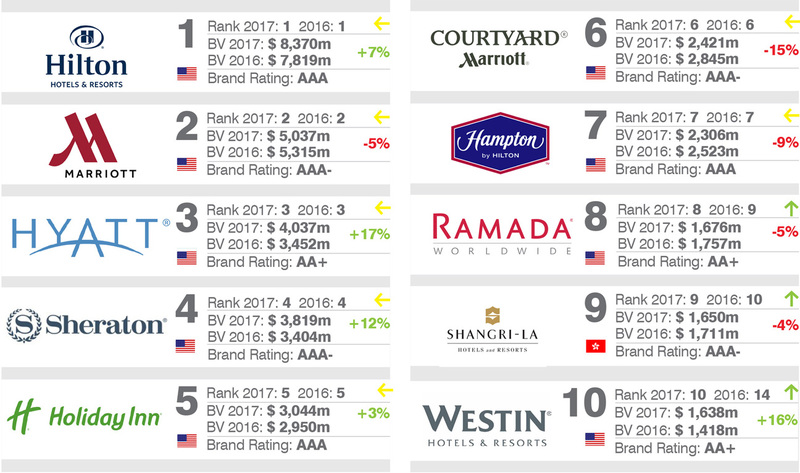 The world’s 50 most valuable hotels brands are then ranked and included in the Brand Finance Hotel 50. According to the consultancy, the world’s strongest hotel brand is Premier Inn. The mass-market, UK-focused brand’s top billing may come as a surprise to some; however, Premier Inn lives up to its name across a broad range of brand metrics from marketing investment to familiarity and consideration. While luxury brands may be notionally more desirable, they are not as widely known as Premier Inn. The budget chain’s value for money also supports higher scores for preference and satisfaction. Premier Inn’s financial performance is correspondingly strong, with total sales up 12.9 percent and like-for-like sales up 4.2 percent in their financial year 2015/16, supporting an 11.9 percent pre-tax profit increase for Premier Inn’s owner, Whitbread. Whitbread has consistently invested in effective marketing communications. Premier Inn was the first mass market UK hotel brand to be advertised on prime time television following its creation in 2007 and has benefitted from high quality, effective advertising ever since. As confidence has grown in the strength of the brand, campaigns have become more emotionally-led, with one recent campaign focusing on Premier Inn’s role in helping friends and family stay in touch. However the operating environment for many major hotel brands is becoming increasingly challenging particularly due to changing customer demands and technology. The advent of Airbnb has allowed access to a vast range of private accommodation that plays into a growing desire for unique, visually interesting and ‘authentic’ accommodation. Airbnb’s brand value is growing more rapidly than any of the major hotel brands. It increased 52 percent year on year to reach a total of US$3.7bn, making it more valuable than all but four of the world’s biggest hotel brands.